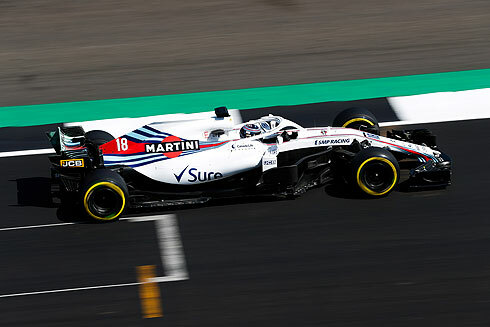 Qualifying for the 2018 British GP would see the Williams Martini team go through an even tougher time with both cars having issues and with only one car setting a time. 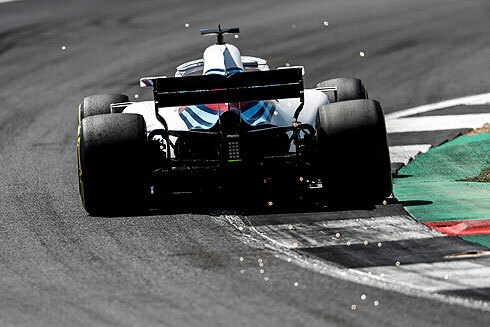 The opening period would see both Williams cars go off the track and for Lance Stroll his spin would see him stuck in the gravel and out of qulaifying even before he could set a time. 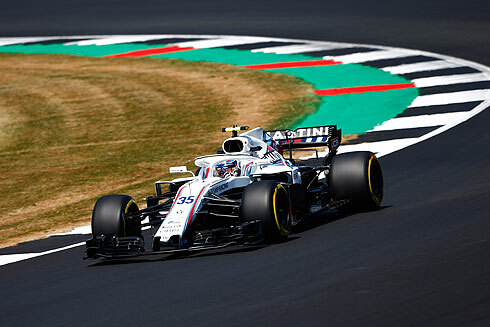 For team-mate Sergey Sirotkin it was not much better as he would also spin but was able to recover and get back to the pits but could only return and complete one timed lap. The Williams cars would finish in 18th and 19th in what must have been the most difficult session of the season. It was later revealed that there was a major issue with the FW41 that had contributed to the spins. Prior to qualifying it was announced that Hartley would not take place due to the damage to his car. The other Torro Rosso had its suspension changed as a precaution. The first eighteen minute period would get underway with drivers coming out all on soft tyres. Raikkonen was out on the medium tyre as Magnussen set a 1m:31.413 only to see Grosjean go quicker with a 1m:28.895. The session would be red flagged as a result of the Williams of Lance going off and been stuck in the gravel. His car would be recovered and the session would restart and Raikkonen would go quickest with a 1m:26.818 but Vettel would go quicker with a 1m:26.585 but he was on the soft tyre. Quickly Hamilton would go second followed by Bottas with both on the medium tyre. Verstappen was now fourth followed by Raikkonen, Leclerc, Ricciardo, Hulkenberg, Grosjean, and Magnussen tenth. Both Williams cars were out of the session with the pair 18th and 19th. The second period of qualifying would see Hamilton fastest with a 1m:26.256 from Vettel, Bottas, Raikkonen, Verstappen, Ricciardo, Grosjean, Magnussen, Leclerc and Ocon tenth. The final period of qualifying would see Hamilton secure pole with a time of 1m:25.892 after having beaten Vettel's earlier time of 1m:25.936. Raikkonen was third followed by Bottas, Verstappen, Ricciardo, Magnussen, Grosjean, Leclerc and Ocon. Not a lot could be said in regard to the Williams teams performance as even with their issues the results are probably where they would have ended up even if both drivers had set times such is their lack of pace..
Lance would come out early in the session using the soft tyre. But it would all go wrong for Lance as he would go off the track and into the gravel ending his session. Lance would leave the car his session over. Lance had lost control of his car at Brooklands and would simply spin off and despite his engine still running could not get out of the gravel. lance would comment say that he was caught out by a big snap of oversteer. Sergey would follow his team-mate out also on the soft tyre. Sergey would be forced to pit as a result of the red flag. He would return but would go off at Stowe but was able to continue and would have to pit again. He was also under investigation for not pitting when the red flag was displayed. Sergey would return on a new set of soft tyre and would set a 1m:29.252 to be 18th and out of qualifying. Replays would show that Sergey had started to turn into the pit lane with the red flag flashing but decided not to enter it.